Haredi rabbi details his community's new approach to dealing with children and teens who are no longer religious. Rabbi Uri Zohar, a haredi rabbi who works with recently-observant Jews, spoke about how parents should handle a child who no longer wants to be religious, Kikar Hashabbat reported. Previously, the haredi approach had been to protect the other children at home by not allowing the newly irreligious child to live at home or have extensive contact with the family. Now, however, that approach seems to be changing. Born into a secular Israeli family, Zohar was a popular comedian and actor in Israel, before becoming a director. 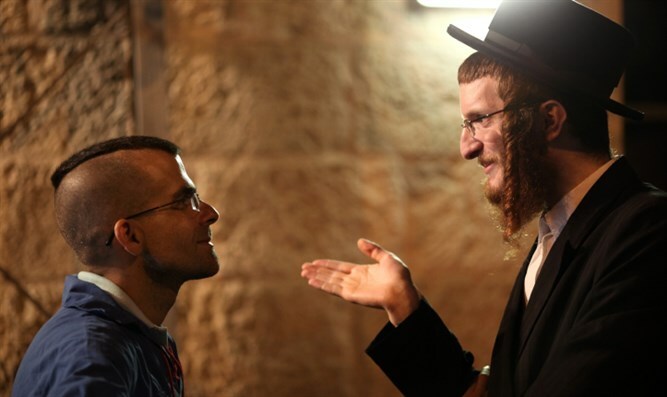 In the late 1970s, however, Zohar became religiously observant, and eventually joined the haredi community, using his background in media and entertainment to reach out to secular Israelis and encourage them to take an interest in Jewish tradition. In a video on Kikar Hashabbat's website, Rabbi Zohar discussed the issue of children raised in religious homes who leave religious observance. In the video, he can be heard saying, "If he comes back at 4:00 a.m. after drinking ten beers, leave him two cookies and write a note that says, 'I love you.'" He also said teens who become irreligious believe that they are faulty human beings, and therefore G-d doesn't love them. "Tell your son or daughter to talk to G-d.... Not [in a] religious [fashion], don't pray the official prayers, just speak to G-d from the depths of your soul," he said. "Other than that, don't tell them anything, not even about ethics. Love them and accept them warmly. It's hard, I know. This is our generation's challenge." Rabbi Zohar also noted what Ponevezh Yeshiva Dean Rabbi Gershon Edelstein answered when asked what to do "if your son brings a girl home." "Will you accept him?" the questioner asked. "It's placing an obstacle in front of a blind person, since there are other children at home." "The rabbi answered that it's 'placing an obstacle in front of a blind person if you don't accept them,'" Rabbi Zohar quoted. "This is an extreme example. I'm not saying you should accept them unconditionally. Sometimes it really is impossible, and you need to find another place. But it all needs to be done with respect and love." Rabbi Zohar also noted that if children don't come home, it's because they don't feel comfortable at home, and they feel like they're hurting their parents and letting them down. He emphasized that children need their parents, but don't know how to express that need while protecting their developing identity. By accepting the children as they are, parents can eliminate the child's need to run away from home. Answering the question of how accepting a newly-irreligious child influences the other children, Rabbi Zohar said, "After we accept him, he relaxes. The other children, when they see that there's no fighting, don't feel a need to take a stance. And if the children ask why he's allowed things that they're not allowed, parents can say, 'When you grow up, you'll understand that each person has his path.'" "When there is an argument, they'll side with their sibling, because he's their friend and the parents are an authority," he emphasized.